Compare End Of Financial Year Solar Specials! 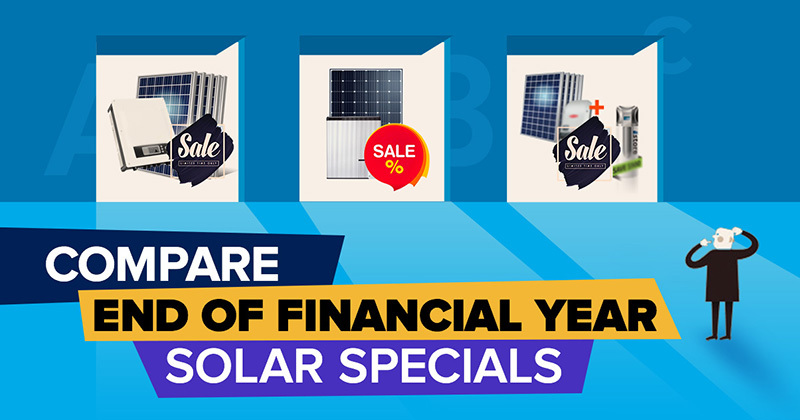 With the end of financial year looming, now is a great time to install solar as there are plenty of special offers available. Even without end of year specials, solar system prices have never been more affordable and when you combine this with power prices that are at all-time highs, you can expect your solar system to pay for itself within 3 -6 years, which works out to be a great investment in anyone’s books. It’s likely that you’ll see plenty of specials promoted online and in the press, but we suggest getting 3 quotes as this helps you get a good range of proposals and increases your chances of getting the best system possible. Get started today and start seeing savings from the day your system is installed!